by Jared Diamond | History | This book has not been rated. "Guns, germs and steel" is the title of the first book I read by this author. It made profound impact on my understanding of the world, the distribution of wealth and power and how this came to be. I look forward to his next book! 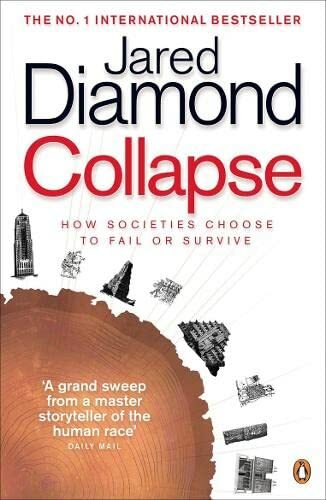 From the jacket: "The broad range of disciplines he weaves in to his writing - linguistics, genetics, animal behaviour, molecular biology and others - caused a reviewer to write: "Jared Diamond is suspected of actually being a pseudonym for a committee of experts". Well this second one was not quite the thrill I expected after the guns, the germs and the steel. In fact, it took me such a long time to read that i got bored long before I finished the book. Then again he is so elaborate and there is so much to say, this could hardly be a smalle tome. the main reason for collapsing societies are deforestation. The Japanese, now, there is a smart people. They started protecting their forests way back in the sixteenth century, resulting now in a First world country with the highest amount of forest, 74%, in the world, and they import woodchips from everywhere, other countries who are still stupid enough to keep on logging their own land.